She's got a sword and she's prepared to use it! 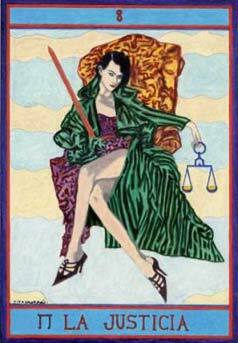 Justice represents what's right and fair, the scales are to weigh and balance, the sword to deal the blow. Normally, Justice is depicted blindfold, indicating that she's impartial and doesn't get emotionally involved. The sword is double edged, so it can swing either way ... watch out!